. . . and babies make four. : More answers . . .
More answers . . .
21. In the photo of you and your husband holding the girls in the matching pretty pink flowery dresses, I am thinking this was your "Gotcha Day" photo. Had you sent those beautiful dresses ahead of time and just hoped they would be dressed in them? How did you get the girls to be so beautifully dresses for you guys? Most babies are not dressed in dresses that I would call that pretty. That photo is from our “Gotcha Day.” All of the girls had on matching, brand new dresses and sandals that the orphanage had dressed them in. Some of the dresses had hot pink flowers and others had orange flowers. 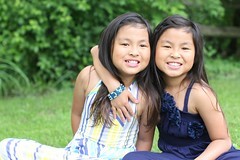 In every Gotcha Day photo I’ve seen of babies from our orphanage, the girls are in matching outfits. 22. For the life of me, I cannot remember where you got those felt moon cakes way back when - can you point me in the right direction? I actually made the moon cakes using a wooden moon cake mold and wool felt. Maybe if I get really motivated I'll make a bunch and sell them and donate the money to Love Without Boundaries. 23. How did you ever get Ralph from Ralph's World to put on a private home concert? Ralph lives in Chicago and books private events based on his availability. He was incredibly nice and made Michal and Kenna's birthday really special. 24. What is your favorite restaurant? Just one? I love to eat out and pre-girls Eric and I ate out a lot. My very favorite restaurant period is T.Cook’s at the Royal Palms in Phoenix. We have celebrated more than one momentous occasion there. The food is delicious and the restaurant itself is lovely. I love Morton’s Steakhouse and could go and eat just the beefsteak tomato salad and the Godiva chocolate cake and be blissfully happy. I really like PF Chang’s, which is now a chain, but was once just a great restaurant in Old Town Scottsdale. Here in Chicago there are so many great restaurants that you could eat out weekly, have an amazing experience each and every time, and never go to the same place twice. We like Francesca’s a lot, love the food at several places in Greektown but somehow seem to frequent Chipolte and Noodles an awful lot. Go figure. 25. I am interested to hear what you did to pass the time while you waited for your twins? Our wait from DTC to referral was only six months, which at the time felt like an eternity! I stalked APC (there wasn’t Rumor Queen then), shopped for baby clothes, co-moderated our DTC Yahoo Group, got the nursery ready, shopped for baby clothes, collected squares for a 100 Good Wishes quilt and made an album of the wishes. I scoured people’s packing lists and created what-I-was-positive was the best-possible packing list ever. I meticulously purchased all the items on the list and yet still didn’t finish packing until the night before we left. I found and interviewed a pediatrician, assembled a medical kit of over-the-counter and prescription medications and read countless books about Chinese history and what to see and do in China. I did a little consulting. I spent some time in Utah with our nephews, took them to Disney World over their Spring Break and then had them come spend a month with us in the summer. Eric and I celebrated our last “childless” Christmas in the Bahamas and I went to California for a baby shower hosted by my college girlfriends and then spent some time with my friend Cara. Oh, and did I mention I shopped for baby clothes -- baby clothes that all had to be returned because they were too small? 26. Have your girls ever had any attachment issues and do they favor you or Eric over the other? I am assuming that they never have, but I thought I'd ask! 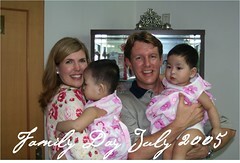 We have an adopted daughter from China whom we got at the same age as you and Eric got your girls. She has huge attachment problems and favors my husband over me. I am very sorry you’re having to deal with attachment issues. I can only imagine how challenging that must be for you, your husband and your daughter. Thankfully, that’s not something we’ve had to deal with. 27. What has been the hardest part of having twins (although I guess it is all you know)? For me the hardest thing about having twins is feeling like I am rarely able to give my full attention to just one child. This was especially difficult during the first year when I was trying so hard to make sure that we did all we could to ensure healthy attachment. There were days where I literally felt like there just wasn’t any more of me to go around. Several times a week one or the other of the girls wakes up earlier than the other and it's such a nice time to just be with one of them, even if we just sit and watch "Super Why" together. I know that all siblings have to share their parents but I think twins are in a unique situation since they are together nearly all the time. There have been times when one or the other of the girls has said, “I just want Mommy alone.” And I don’t blame them. It’s got to get old after awhile to share every moment of every day with another person. 28. I can tell that you are extremely intelligent. What did you study and what was your career (pre-Michal and Kenna)? You are too kind my friend! I graduated from UCLA with a degree in English. 29. What is your cocktail of choice? Club soda with a lemon. I'm a bit drink-challenged! I don’t drink alcohol (I just don’t like it), no caffeine (I gave it up eight years ago, except of course for chocolate), no artificial sweeteners (I gave those up eight years ago too) and no coffee (I’ve never had a cup). I do adore ginger ale with a lime but I only have it occasionally. Eric always jokes that he can tells it’s been a rough day if he comes home and I’ve got a wine glass filled with ginger ale in my hand. 30. Do you cook every night and what do the girls do while you are cooking? I cook for the girls every night but not for Eric and I. I wish I could say that the girls ate exactly what we do but they don’t so several times a week Eric and I have take-out but I still make dinner for the girls. Michal and Kenna sit at the kitchen table and do workbooks or go downstairs and play in their playroom while I get dinner ready. They also sometimes help me cook or set the table for me. 31. What is your all time favorite book? 32. When your twins were younger, did they do "twinspeak", where they talked to each other and understood each other, but you couldn't understand them? Just wondering as my twin and I were late talkers, but jabbered at each other for ages first. The girls didn’t “twinspeak” as babies but they do now. They’ve created a whole list of words that they’ve made up and use as if they’re real words. The worst part is that I catch myself using them too! My newest favorite is “nonagon.” That’s a nine-sided shape like an octagon or pentagon. Feel free to sprinkle it in your daily conversation! 33. The girls both seem so laid back and well behaved. What is the best aspect of each of their personalities and what is the most challenging aspect of each of their personalities? 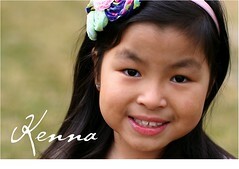 Kenna is very kind and compassionate and has the greatest giggle and gives the biggest hugs. 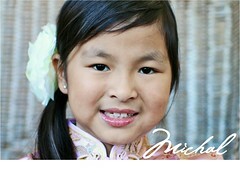 She really has a sweet disposition and is an amazingly easy-going child. She literally skips everywhere she goes and loves to jump down two steps at a time. She is also our child of passive resistance. She usually doesn’t overtly fight with Michal. Instead, if she’s frustrated, she will do something to subtly drive her crazy. One time I heard Michal yelling and went to the playroom to find Kenna lying across the bottom of the slide. Michal wanted to go down the slide but Kenna was in the way. Kenna was lying there, doing nothing, simply to bug Michal. Michal is funny and confident and incredibly loving. She too skips everywhere she goes and is a super snuggly child. She is also very strong-willed and enjoys being in charge. We like to say she’s precocious, which ironically is exactly how my mom describes me as a child. What’s the most interesting is how complementary the girls’ personalities are and how they have worked out their relationship in a way that just works. 34. Now that we all love to read and watch your blog, how long do you plan to continue it? Do you scrapbook your photos? I’ll keep writing the blog until Michal and Kenna get old enough to protest. Before the girls I kept detailed, elaborate scrapbooks. 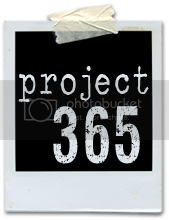 I now have 15,529 photos (yes, that’s the real number!) on my computer. I’ve only printed a handful in the past three years and the task gets more and more daunting as the days go by. So the blog is my version of a scrapbook for the time being – plus, it makes my mom happy to see pictures of her granddaughters! 35. Are your girls completely into Disney Princesses? How do you deal with it? Yes! And this is a new thing. Ironically they’ve never even seen one of the Disney princess movies but that doesn’t seem to matter one bit. (They did see princesses in person at Disney World a year and a half ago.) I’ve actually been to Target and WalMart trying to find Cinderella for them to watch but neither store had it. I guess I’ll have to order it online. It doesn’t both me . . . yet. :) I actually think it's pretty cute and since we're going to Disney World for their 5th birthday it's nice to know they'll be excited about it. 36. Sharing a room-Does bed time go smoothly? Not always. Michal and Kenna like to chat with each other, sing songs together and occasionally climb into the same bed. I try to chalk it up to “sisterly bonding” but some nights have to put a stop to it. 37. Was it difficult to make your decision to be a stay-at-home mom? Surprisingly, it wasn't and I would have expected it to be. 38. Have you made a lifebook/s for the girls? Yes. I actually made them each a book that was shamelessly plagiarized from "Tell Me Again." It's just about us coming to get them in China, Gotcha Day and the day after. It matches the meter and concept of Jamie Lee Curtis' book, which they were already familiar with. I did them digitally and love how they turned out. I've also created digital lifebooks for each of them but haven't finished them. Two things on my never-ending to-do list. I am usually able to get stains out but will admit that I have thrown more than one piece of clothing away, usually because we did a "messy craft" without changing clothes first. I only use unscented, dye-free detergent on their clothes because their skin tends to be pretty sensitive but, and don't tell my husband I'm admitting this, it doesn't clean as effectively as "real" Tide. For stains I use Spray-n-Wash with Resolve (it’s in a red bottle) and add Arm and Hammer Washing Soda to the load. That seems to get most things out. I seem to have the most trouble if I miss a stain and something gets through the dryer before I catch it. 40. How many hits a week does your blog get? In the almost three years that I’ve written the blog it’s gotten 2,744,054 hits.